It has been 9 months since veteran actress Sridevi passed away but her family is still in shock for her death. Whenever husband Boney Kapoor hears the name of the wife he got emotional and starts crying. The same happened again in 49th International Film festival of India (IFFI) held in Panaji, Goa. Here Boney Kapoor reached to the film festival with his daughter Janhvi Kapoor. Here both discussed a lot about Indian cinema and Bollywood, in the midst of this while talking about Sridevi, Boney Kapoor got emotional and took a time to came out of it. 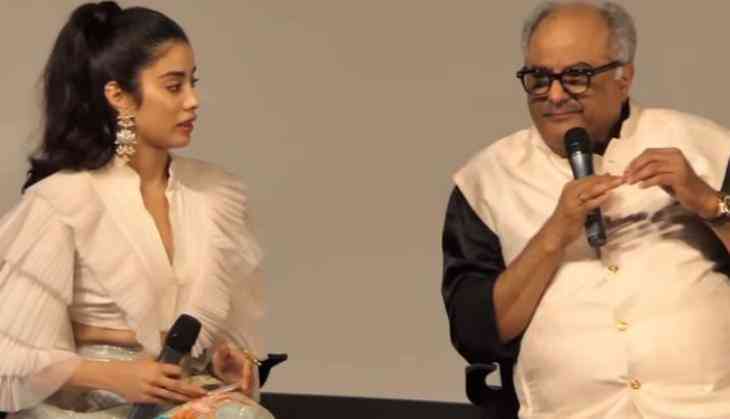 Janhvi Kapoor who was with her father on the film festival also got emotional and shared an emotional poem for her mother. In this 45 minutes conversation whenever the duo took Sridevi's name they got emotional and after seeing this situation even the writer Rumi Jeffery got silent. Janhvi also shared an emotional poem in the memory of her mother Sridevi.